After six weeks of smooth sailing, the San Diego Surge are set for what should be their toughest matchup of the season. The Central Cal War Angels come to town this Saturday with a perfect record and will be looking for their second straight win over the Surge. The last time these teams faced off was during last season's conference semifinals where the War Angels came away with a 40-14 victory, forcing the Surge to miss the national title game for the first time in team history. "We took the opening drive, went on down [to the goal line], they stopped us, and we never recovered," said Surge defensive coordinator Mike Suggett, who served as the team's head coach from 2011 to 2013. "We lacked the speed and experience in some key positions to do what we wanted to do." With more depth on both sides of the ball, the Surge are hoping for better results this time around. In only five games played this season (earned a win via forfeit), the Surge are outscoring their opponents 346-12, a team record for most points scored during the first five games of a season. With the help of receivers like Kaycee Clark, Lanika Manning, and Holly Peterson, quarterback Melissa Gallegos is proving to be a scoring machine with a total of 15 touchdowns passes during her comeback season. Anchoring the rushing attack is Deana Guidry, who also showed off her skills in the return game by scoring on the last two opening kickoffs. Spelling for her is former track athlete Alexis Synder, who has a total of nine touchdowns (rushing and receiving). Of course none of that is possible without a talented offensive line leading the way. The Surge defense have only allowed one touchdown this season. That is mostly due to a disruptive pass rush featuring Knengi Martin, Tanya Paaluhi, and Crystal Stokes. You can also credit the outstanding pass coverage from Ashley Moody, Tracy Wong, and Sonfre Roberson. "They're doing the little things I've asked them to do," said Suggett. "How good are we really? We'll find out this week when we play a real high quality opponent." "I like to think we're good, but we still have a lot of learning to do." The War Angels are led by head coach Jeff Starr and a one-two punch rushing attack featuring Destanie Yarbrough and LaStar Brown. They also return three-time All-American quarterback Chantel Wiggins, who threw for four touchdowns during that fateful playoff meeting. 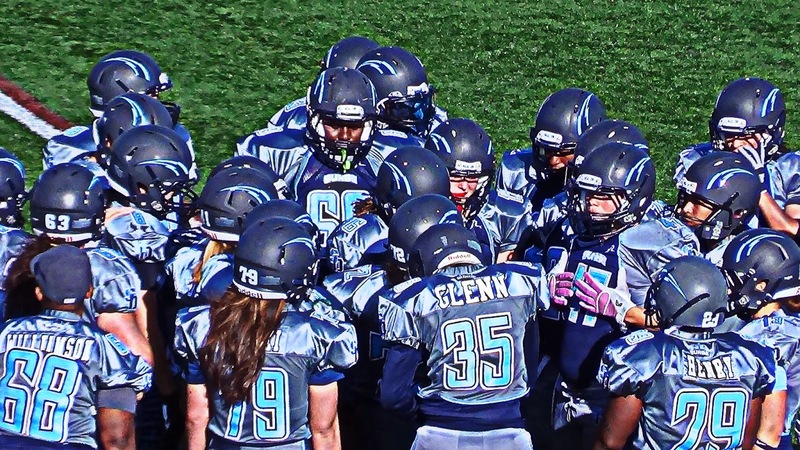 Their key playmaker on defense is linebacker Moneisha Washington, who recorded two interceptions, three fumble recoveries, and three touchdowns against the West Coast Lightning on April 19th. A performance that earned her WFA Player of the Week honors. In only four games played this season, the War Angels have outscored their opponents 178-36. "Jeff King does a great job with the War Angels," said Suggett. "They're always a good opponent and a dangerous team." "We're going to have a good old fashion 70's style slugfest on our hands," Suggett added. After this game, both teams will get two weeks off before they close out the regular-season on June 7th with a rematch at Fresno.